The Searzall is an attachment that “turns a blowtorch into a hand-held supercharged instant-power broiler.” For those who like to sous vide in the kitchen at home, there are usually a few methods to achieve that final sear on the item being cooked (as any good cook knows, the Maillard Reaction is key to achieving maximum flavor). One of these is to use a blowtorch, but the problem is that it can add a subtle but odd flavor to your food. You can also heat a skillet or pan on the stove to the point when your oil is rippling and smoking, but many people don't have a home range powerful enough to achieve the high temperature necessary to get a beautiful sear. If your pan isn't hot enough, by the time you achieve a nice sear the middle of the meat is overcooked, ruining the whole reason for sous vide in the first place. I usually use my range to sear, it works well enough, but the Searzall promises to be the most versatile method to sear a wide range of food items. It looks very steampunk, too. I just backed the project on Kickstarter. Supposedly all techies need to obsess over the craft of making coffee. I don't really drink much coffee, though, so my substitute is obsessing over precise cooking techniques. I can’t remember when I first heard of the cooking technique known as sous vide, but I recall that when I did, I desperately wanted to use the technique at home. It sounded too good to be true. My interest in cooking was just spinning up, but at the time, the equipment necessary to try it at home was cost prohibitive. I’d scour eBay hoping for used deals, but even used immersion circulators ran north of $1,000 at the time, and that wasn’t even taking into account the cost of a chamber vacuum sealer. A few die hard hobbyists whetted my appetite by posting sous vide cooking times and tips on eGullet, most famously Nathan Myhrvold. But during those years, I had to content myself with tasting the occasional meat cooked sous vide at restaurants. For those not familiar with sous vide cooking, the term is French for "under vacuum." The item to be cooked is vacuum sealed in a plastic pouch and then cooked in a water bath whose temperature is controlled precisely, traditionally using an immersion circulator which is simply a device that takes in water, heats it to a specific temperature, and circulates it back out. I first used one in biology class years years ago, never dreaming someday I'd be eating dishes heated up by said device. In late 2009, a semi-affordable home sous-vide solution came on the market, the Sous Vide Supreme. It didn't circulate water, so it was called a "water oven." Circulated water tends to keep the water at an even temperature throughout the container you're cooking in whereas the Sous Vide Supreme was more susceptible to variations in temperature within the water, the same way gas ovens can have hot and cold pockets of air. At $500, it wasn't cheap, but I couldn't wait any longer and ordered it to ship the first day it hit the US market. For a vacuum sealer, I went with one from FoodSaver (very similar to this one), which produces the most affordable and popular units on the market. The compromise here was that these weren't chamber vacuum sealers, so you couldn't use it to seal liquids in with your food. if you wanted to, you had to resort to freezing the liquid first, or other hacks, some of which failed and left puddles of marinade on my kitchen counter. Finally, I needed some cooking tables. At the time, there weren't many books on the topic, only two of prominence. I picked them both up. One was Douglas Baldwin's Sous Vide for the Home Cook. Not the most beautiful book, a paperback with nary a photo to be seen, but a solid introduction to the technique, with very accessible recipes, and most importantly, a source reference for cooking times and temperatures for a variety of foods. 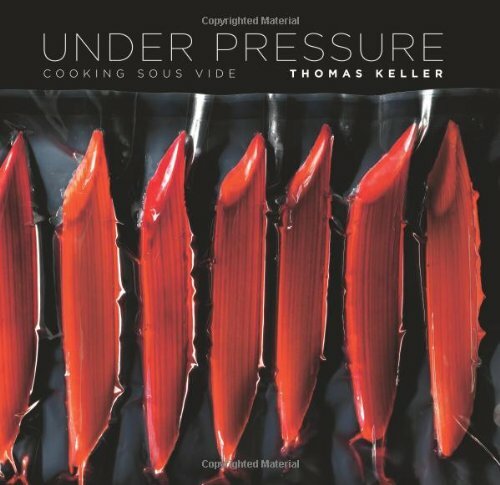 If Baldwin's book was the functional starter guide, the other book out at the time was more like a coffee table book: Thomas Keller's Under Pressure. Filled with gorgeous color photographs and some recipes that most home chefs wouldn't dream of attempting, it made for a useful contrast to Baldwin's more plain guide. In the ensuing years, the number of books and websites on the technique have multiplied several times over, with the technique receiving ample coverage in Nathan Myhrvold's amazing cookbook Modernist Cuisine. Google "sous vide recipes" and add just about any ingredient and you'll find the test results of amateur chefs playing with the technique. In that same period, I've upgraded my sous vide setup. I replaced my Sous Vide Supreme with a real immersion circulator from PolyScience. The advantage of an immersion circulator, as noted earlier, is that the immersion circulator circulates the water. The Sous Vide Supreme heats up the water, but the water sits statically inside the unit. Circulated water ensures the temperature of the water is more even throughout, and my PolyScience tends to heat up faster and hold temperatures more precisely than the Sous Vide Supreme. Immersion circulators have traditionally been outrageously expensive, but signs of price contraction are popping up. Nomiku, a Kickstarter project to build a $359 immersion circulator, blew past its $200,000 goal to end with 1,880 backers fronting over half a million dollars. It has yet to ship, with an ETA of early 2013. In the meantime, PolyScience has come out with a lower priced immersion circulator line it dubs the Creative Series. At $499, It circulates water at half the flow of the $799 Chef Series, and it's designed to handle only up to 5.5 gallon baths as opposed to 8, but honestly those are hardly deal breakers for the vast majority of home chefs. At $499, I'd recommend most people choose a Polyscience Creative Series immersion circulator over the $429 Sous Vide Supreme. I've also picked up a used chamber vacuum sealer from a restaurant off of eBay. I've yet to find a really affordable chamber vacuum sealer, but this model from Sous Vide Supreme, the VacMaster VP112, is the closest at $665 from Amazon. If you want to upgrade from a FoodSaver model to a chamber vacuum sealer so you can vacuum pack liquids, that's the unit I'd recommend. You can purchase vacuum bags off of eBay for cheap in bulk, or if you have access to a restaurant supply store, they often have great deals. Of course, the prices I'm citing here are not ones most reasonable people would consider affordable. They're on the right price trajectory, though. I'm optimistic that increased demand and economies of scale will push both immersion circulators and chamber vacuum sealers into the sub-$200 range within three years. It's simple. Simply put meat in a pouch, vacuum seal it, punch in the temperature on your immersion circulator, then drop the pouch in the water when the target temperature is reached. Cooking tables give you the amount of time to leave the pouch in the water. When it's done, just pull the pouch out, cut it open, and your food is ready for finishing. If you can't prepare food sous vide, you're not a bad cook, you're just plain lazy or incompetent, or both. It's forgiving. With many proteins and vegetables, you can leave the pouch in the water longer than the recommended cooking time with no harm. For a home chef preparing multiple items at once, and even restaurants trying to fulfill multiple tickets at a time, that's a godsend. It's low fuss. While your food is in a water bath, you don't have to worry about keeping an eye on it. The water won't boil over, and you won't set your house on fire. I often sous vide meats for several days at a time, and I never worry about leaving it running while I'm at work. For quicker recipes, I drop the bag into the water bath when I get home, and while I'm waiting I can go watch ESPN or check email or go for a run. For busy professionals used to multitasking, sous vide is ideal. Set it and forget it. The results are spectacular. The bane of home cooking is overcooked meat, and even an advanced home cook often overdoes proteins because heating meats has always been a delicate and difficult balancing act, trying to ensure the center of the meat is cooked properly without overcooking the exterior. Simply learning the quirks of your stove, oven, and cookware takes much repetition, and most normal people I know just don't have the time or interest to log the necessary reps. Even for those who do, the laws of physics have always meant that cooks are compromising between the exterior and interior temperature of the meats. Sous vide doesn't force you to make that compromise. Sous vide can get every part of your protein to the exact target temperature because the meat can't get any hotter than the water, which is held at the temperature you've dialed in. Beef, chicken, pork, fish: everything comes out tender and juicy. Once I started to sous vide, I could no longer tolerate overcooked meats when out at restaurants. The invention of the microwave sped up home cooking, but it's a terrible way to heat most foods because it essentially steams everything. Sous vide can be just as revolutionary for the home cook as the microwave but with far superior outcomes. You can save money by buying your proteins in bulk. I purchase most of my proteins in bulk from CostCo, saving on the price per pound. When I get home, I split the meat up into individual portion sizes, vacuum seal each portion, then put them in the freezer. Sometimes I even mark the target sous vide cooking time and temperatures on the bag with a grease pen. Then, as the weeks go by, I just pluck one out whenever I'm in the mood for that meat the next day. My only complaint is that almost every apartment I've rented has a freezer that's too small for me to store even more vacuum sealed meat. Of the objections to sous vide, cost is by far the biggest factor. It's just not as cheap as it should be yet. But I have a few counters to this. One is that I see plenty of home kitchens with all sorts of expensive appliances that are barely used. Food processors, KitchenAid mixers, panini makers, grills, $500 coffee machines. I get far more use out of my immersion circulator than any other gadget in my kitchen. The second is that my conversion rate on cooking my ingredients properly with the sous vide machine is so much higher than with any other method. With sous vide, more of my grocery purchases turn into tasty meals. If you enjoy good food the way I do, that has a real impact on your happiness. I eat the same number of meals as I did before I started sous viding, but way more of them leave me rubbing my belly with a big grin on my face. The other objection I hear a lot is that it's cheating. This is just silly macho kitchen posturing, and most home chefs will have no guilt whatsoever in turning to a simpler yet more precise way of cooking. So much of home cooking is probabilistic, and sous vide pushes it towards being deterministic. For all of the health issues in the U.S., anything that makes it easier to prepare great food should be welcome with open arms. It's a technique so effective that nearly every high end restaurant in the country has several immersion circulators running all the time. If sous vide is cheating, then Thomas Keller, Heston Blumenthal, Grant Achatz, David Chang, and all those other great chefs are guilty. Besides, sous vide doesn't remove the need to learn other cooking techniques. If you love the flavor produced by the Maillard reaction, you'll still need to sear your protein before or after it cooks in your water bath. I like to sous vide certain cuts of meat, but sometimes I still like to take a nice ribeye, sear it in my skillet, and finish it off in the oven. There's no substitute for the crispy skin of a chicken roasted in the oven. But there's also no substitute for the texture of short ribs cooked sous vide for 72 hours, or pork shoulder that's been in the water bath for 48 hours, or a fatty piece of salmon that comes out of the water bath after just 15 minutes, beautifully and evenly cooked, still glistening. Plate something like that for your family and friends and you'll feel like a hero. Food in a plastic bag doesn't produce the wonderful aromas that permeate a kitchen in full bloom, and at times it can feel almost too clinical a technique, more the province of a laboratory than a home kitchen. Likewise, a handwritten letter has a personality and texture that no email could match, but the last time I checked, and about the last couple of thousand times I checked before that, I hadn't received any handwritten notes. So much of nostalgia is just denial of the practical.